As colleges continue to advance their student success agendas, the Center has provided tools and resources to assist in this effort. All of the items below were created as part of the High-Impact Practices Initiative, through generous funding from Bill & Melinda Gates and Lumina Foundations. 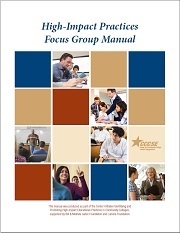 This focus group manual, a comprehensive "how-to" on conducting focus groups, was originally designed for the Center's focus group work with six partner community colleges. The components of the manual have been adapted and can be customized for wider use by all community colleges interested in improving outcomes for all students. As a supplement to the manual, the six focus group protocols and questions used at the partner colleges were also adapted for wider use. These Center videos on six promising practices include clips drawn from the focus groups conducted with the partner colleges. In these focus groups and interviews, community college students, faculty, staff, and administrators share their experiences and thoughts about what helps students achieve their academic goals while participating in these promising practices. There are no more qualified informants regarding student experiences than the students themselves. These videos contain students’ descriptions of their experiences in these programs and classes that have helped them achieve success as they strive to reach aspirational goals in postsecondary education, work, and life. See more video clips on the Center's YouTube Channel. The Community College Institutional Survey (CCIS), the Center's newest instrument, was developed to complement the Center's ongoing national work on identifying and promoting high-impact educational practices in community colleges. CCIS, which is available to all colleges free of charge, is a tool that allows colleges to systematically gather data about key promising practices, the target student populations of those practices, and the scale at which the practices are currently implemented. The Center's work on promising practices—through the collection and analysis of special-focus item data on the CCSSE and SENSE surveys, as well as faculty responses on the CCFSSE—has produced information of significant value for community colleges: empirical confirmation of high-impact educational practices in community colleges and quantification of the extent to which those practices are part of the current experience of students. Ongoing analysis will provide new evidence of how student participation in these practices is related to overall student engagement, academic progress, and college completion. The CCIS has and will continue to contribute highly valuable information about the institutional context for these practices. The exercise of completing the survey will not only provide knowledge about institutional programs and practices, but also further constructive conversations with leadership teams about current student success initiatives. CCIS is a dynamic online instrument; however, a modified PDF version is available for download and printing. WHICH COLLEGES HAVE PARTICIPATED IN CCIS? To date, over 500 institutions have participated in CCIS. HOW CAN MY COLLEGE PARTICIPATE IN CCIS? To access CCIS and complete the online survey you will need an access code. If you do not know your access code, please contact Center staff at 512-232-6458 or request your access code by e-mailing ccishelp@cccse.org. Once you receive a unique access code, your institution can complete the online survey. If you have any questions while completing the survey, please review the Frequently Asked Questions on CCIS. If you still have questions after reviewing the FAQs and wish to speak to someone, please contact Center staff at ccishelp@cccse.org or 512-232-6458. HOW SHOULD MY COLLEGE USE THE COMPLETED CCIS REPORT? 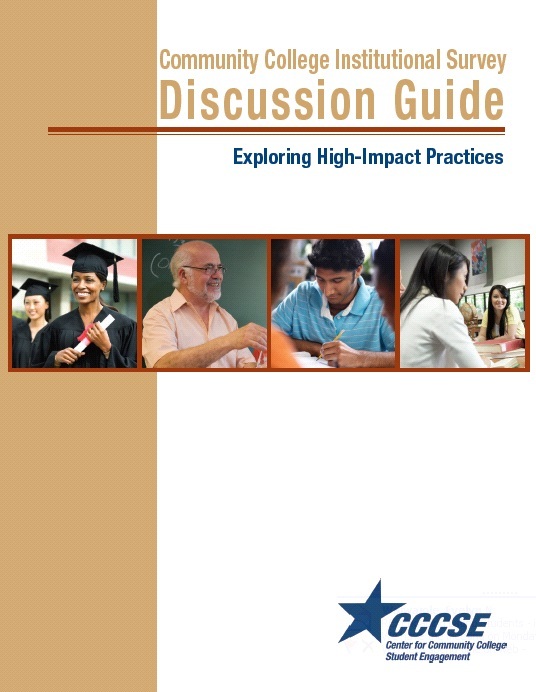 The CCIS Discussion Guide is a companion to the survey and is intended to serve as a tool for strategic, data-informed conversations on community college campuses to assess current student success programs and policies. Armed with this knowledge, community college leaders, faculty, and staff can consider the most effective ways to heighten the quality of educational experiences for larger numbers of students. The student characteristics described here are the reality of community college students today. Most are attending classes and studying while working; caring for dependents; and juggling personal, academic, and financial challenges. Colleges can help students plan their coursework around their other commitments and develop skills to manage the demands on their time. There is emerging consensus that certain design principles are critical for student success. All of these principles maximize student engagement by making it both intentional and intensive. No matter what program or practice a college implements, it is more likely to be successful if its designers consider these principles. As colleges examine and redesign students' educational experiences, they will benefit from thoughtful discussions that include a range of stakeholders. These discussions should be informed whenever possible by data, so participants can evaluate the effectiveness of the college's current practices as well as those under consideration.